Oh no! I really do need to eat my vegetables! : Who, What, How, and Why? I've spent a huge chunk of my life feeling sick. Not, "I have a cold, don't shake my hand please," but someone walked in the house with some McDonalds and I'm going to go to bed now. Or migraines after being exposed to certain things, or nausea weeks, or just chronically feeling lousy and not really knowing why. So I started not eating the things that made me feel sick... most fast food places, donuts, etc. and I tried to eat "healthy." Some progress was made. I started to really use herbs, checked out chiropractors, worked with someone who did NAET (HUGE HELP!) and got married and had a baby. Pregnancy seemed to help too, after spending three months very sick (translate, I lay on the couch and was useless). I still would occasionally eat something or being around something that made me feel awful, and there were still quite a few problems that indicated that my body was not totally well, but they were tolerable enough to generally be mild aggravations. Then I discovered that my baby had food allergies, despite the fact that I breastfeed. I started cutting different foods out of my diet in an effort to help her rashes and diarrhea and colick go away. And as a researched her troubles, I realized the time had come to do something really serious to work on my own chronic issues. I learned that just how much mom’s health really affects baby’s long term health. From the moment he or she is conceived, the baby’s health and development is affected by mom’s health. I don’t want to have a bunch of kids with severe allergies. Now, after several months of brain-overload, I’ve come to trust the work of Weston Price, Nourishing Traditions, Dr. Natasha Campbell-McBride and Gut and Psychology Syndrome, and many other knowledgeable people too numerous to name. You then come to the summary of what I am working towards - the full GAPS diet, taking into account the methods recommended by Nourishing Traditions, and with the extremely challenging modification of no fruit. At least, not yet. I hope I can cure my baby of her fruit allergies, or at minimum narrow them down, and maybe once she weans I’ll pig out on strawberries again. Most hard cheeses are allowed, but I am also allowing raw dairy since it is so beneficial and there are no signs of dairy intolerance. My baby also doesn't tolerate sweet potatoes (not GAPS legal anyway), carrots, peas, and fish - though she seems to do ok as long as the fish is limited. I'm skipping the intro and the stages as I don't have severe digestive issues, and with a completely dependent nursling I don't want to detox too quickly. I’m continually grateful to the many bloggers who have shared their methods and recipes and resources as they work on eating more healthfully, and I figured that the least I could do is share my own discoveries and challenges. I plan to do posts of recipes, ideas, and at least a weekly note of progress while doing this diet. I welcome your comments and encouragement! UPDATE! 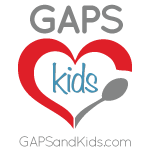 - You can read about how GAPS has helped me here.